chest, anything from a wooden box for food storage to the special store of personal treasures and valuables. kist o dreams and Bairn's Kist provide a resource for anyone interested in lullabies and children's songs from Scottish tradition. If you are looking for the words to a half-remembered snippet of song from your youth, you may find it on this website. If you are interested in hearing a selection of lullabies or children's songs, you can listen to some of the tracks here or on the CDs. Scotland has a rich heritage of song, and lullabies and children's songs are integral to it. The original kist o dreams CD presents a selection of 14 songs in Scots, Gaelic, Shetland dialect and English, spanning hundreds of years of Scotland's heritage. The Bairn's Kist CD consists of a collection of 25 songs - dandling songs, action songs and singing games, and a couple more lullabies too. I'm really excited about all the additional lullabies I have been able to add to the kistodreams.org website! 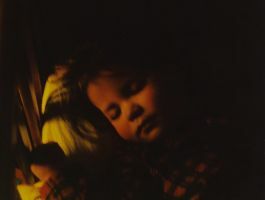 It's thanks to a small grant from TASGADH and it opens up a range of lullabies which were not included on the original album, but are just as much a part of Scottish lullaby tradition. These include songs which are very dark in their themes, such as the classic "Griogal Cridhe (Beloved Gregor)", which commemorates the execution of the singer's husband, Gregor Roy MacGregor. The beheading had been carried out by her own brother and father, in front of her and her baby, in 1570. Also included is the unusual "Hushie Baa, Ee-a-baa", a North East lullaby sung from the point of view of the husband of the baby's mother, who knows he is not the baby's natural father and songs from modern tradition, such as the moving "Naoidhean mo Ghaoil (My Heart's Bairn)", mourning the loss of a stillborn baby by Alpin James Bruce Stewart and Zetta Sinclair's sweetly gentle, "Lullin' the Littlin". Full lyrics are given for each lullaby and a link, where available, to a video or audio clip of the song - just use the drop down menu to select the song.